Hier haben wir die offiziellen Bilder zu den kommenden Transformers Hero Mashers. Das sind Figuren, bei denen man die Gliedmaßen untereinander austauschen kann. Gefallen mir sehr gut, vor allem Megatron, Starscream und Bulkhead. Gefallen mir allesamt sehr gut ! Hier haben wir die Verpackungsbilder zu den neuen Transformers Hero Mashers. Zu sehen sind Rodimus, Jetfire und Autobot Heatwave. 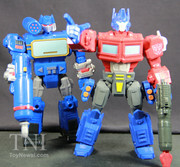 Hier sind die offiziellen Bilder zum Hero Mashers Electronic Optimus Prime. Hier haben wir die offiziellen Bilder zu den beiden Hero Mashers Figuren Dino-Mode Slug und Soundwave. Slug hat Snarl Teilen und Soundwave hat Sideswipes Arme dabei. Hier ist die Review zu den Transformers Hero Mashers Optimus Prime, Megatron & Starscream. Hier ist das offizielle Bild zum Transformers: Hero Mashers Jetfire. 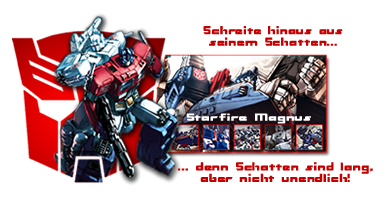 Hier haben wir eine neue TV Werbung zu den Transformers Hero Mashers Bumblebee, Optimus Prime und Grimlock. Hat irgendjemand mal ein Größenvergleich zu Classics Deluxe Figuren? Megatron und Soundwave schauen nicht schlecht aus. Gibt es die auch in Deutschland? 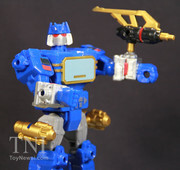 Hier haben wir die Review zum Transformers Hero Mashers G1 Soundwave. Sehen doch ganz cool aus. Und ja... würde mich interessieren ob die auch hier erhältlich sind. 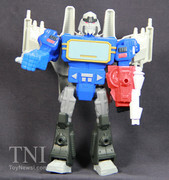 Hier ist die Hasbro Pressemitteilung zu den Transformers Hero Mashers. Mash up your Bot, and then crack up your friends! Hasbro’s TRANSFORMERS HERO MASHERS feature your favorite AUTOBOTS, DECEPTICONS and DINOBOTS with interchangeable parts and accessories, so kids can create their ultimate (or ultimately silly!) Bot. What if BUMBLEBEE rolled into battle with SIDESWIPE figure’s head and GRIMLOCK figure’s feet? With more than a dozen TRANSFORMERS HERO MASHERS characters planned for 2015 and new looks based on the characters from the new animated series TRANSFORMERS: ROBOTS IN DISGUISE, there’s tons of ways to mash them all! Hasbro’s TRANSFORMERS HERO MASHERS feature your favorite AUTOBOTS and DECEPTICONS with interchangeable parts and accessories, so kids can create their ultimate (or ultimately silly!) Bot. 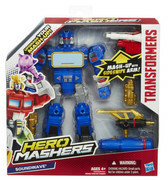 New for 2015, TRANSFORMERS HERO MASHERS features new characters and new looks based on the animated series TRANSFORMERS: ROBOTS IN DISGUISE and new Beast shapes. 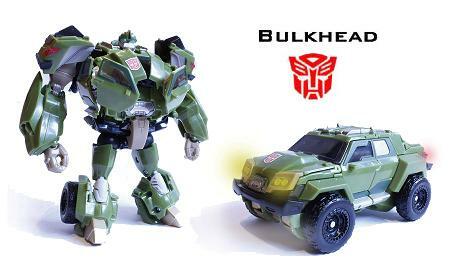 With TRANSFORMERS HERO MASHERS, the possibilities are colossal for you to create the ultimate mash-up! Six figures will be available in this assortment in 2015. Each figure is sold separately and comes with an accessory. Figure does not convert. Hasbro’s TRANSFORMERS HERO MASHERS feature your favorite AUTOBOTS, DECEPTICONS and DINOBOTS with interchangeable parts and accessories, so kids can create their ultimate (or ultimately silly!) Bot. Each TRANSFORMERS HERO MASHERS BATTLE UPGRADEfigure comes with multiple Battle Gear pieces for even more crazy combinations! 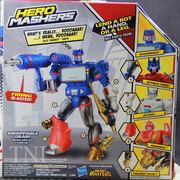 With TRANSFORMERS HERO MASHERS, the possibilities are colossal for you to you to create the ultimate mash-up! Five figures will be available in this assortment in 2015. Each figure sold separately. Figure does not convert. 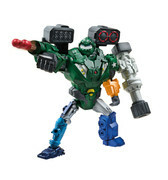 Hasbro’s TRANSFORMERS HERO MASHERS feature your favorite TRANSFORMERS characters with interchangeable parts and accessories, so kids can create their ultimate (or ultimately silly!) Bot. 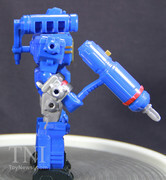 Each TRANSFORMERS HERO MASHERS ELECTRONIC figure comes with multiple Battle Gear pieces, including a launching missile and an electronic light-up piece, for crazy combinations! 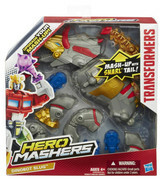 With TRANSFORMERS HERO MASHERS, the possibilities are colossal for you to you to create the ultimate mash-up! Two figures will be available in this assortment in 2015. Each figure sold separately. Figure does not convert. Includes two 1.5V LR41 batteries. Hasbro’s TRANSFORMERS HERO MASHERS BUMBLEBEE AND STRAFE MASH PACK lets you start making wacky mash-ups right out of the box with two of your favorite TRANSFORMERS characters—BUMBLEBEE and DINOBOT STRAFE! Each figure in the set features interchangeable parts and accessories, so kids can create their ultimate (or ultimately silly!) Bot. Make a BUMBLEBEE figure with pterodactyl wings, or a STRAFE figure with wheels—the possibilities are limitless for you to create the ultimate mash-up! 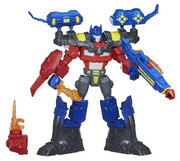 The TRANSFORMERS HERO MASHERS BUMBLEBEE AND STRAFE MASH PACK comes with two action figures, Battle Gear and launching missiles, and is fully interchangeable with other TRANSFORMERS HERO MASHERS figures, sold separately. Figures do not convert.